Frank Fontana, “The Design Dude,” has invited Anne to appear as the featured guest on one of the top radio stations in the United States, WGN Radio AM 720 Chicago, when she joins him on his show at 2 p.m. on Saturday, April 20. NOTE: Hear the show by tuning in WGN Radio at AM 720 in Chicago, or listen online by going to http://wgnradio.com/listen/. An astrologer, writer, and artist, Anne is an expert on communicating how astrology can help anyone improve his or her surroundings. She is the author of the art and astrology book Follow the Sun: A Simple Way to Use Astrology for Living in Harmony, and she is an award-winning artist and web designer. 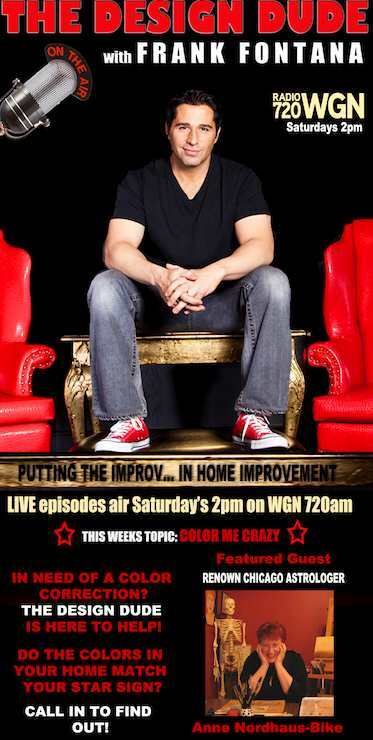 Hear the show by tuning in WGN Radio at AM 720 in Chicago, or listen online by going to http://wgnradio.com/listen/. Anne Nordhaus-Bike is a painter and mixed media artist working in Chicago. A frequent and popular guest on WGN Radio in Chicago, she's won numerous communication awards and has been honored by the National Women's Hall of Fame, which added her to its Wall Of Fame.